I have no hesitation in saying that September 2013 was one of the best conventions that I can remember! A full house on Saturday when unfortunately we ran out of chairs owing to the fact that the Imperial was also hosting various wedding functions – but thankfully most everybody who needed a seat got one. 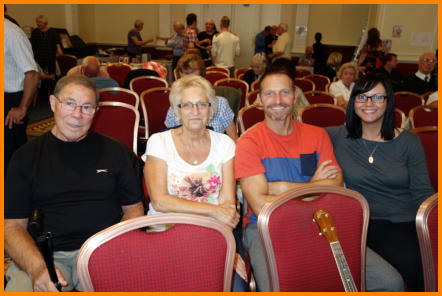 Members and visitors (who then became members) gathered in the Lancastrian Suite from 10:30 onwards on Saturday morning, chatting and playing and just enjoying the fact that they were once again at a GFS convention. 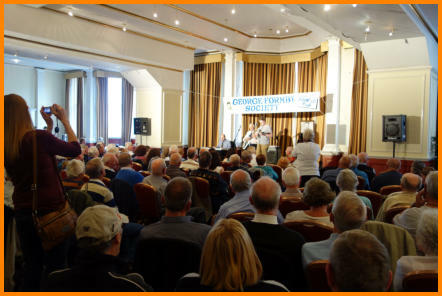 This, the 52nd year in the Society’s history, must have warmed the cockles of founder member John Walley’s heart to see how the GFS has prospered over the years and although it is sad to note that founder members are now very scarce indeed, John is still the most active and still plays a vital role as one of the MC’s in the convention weekend as well as providing many articles for our quarterly magazine The Vellum. 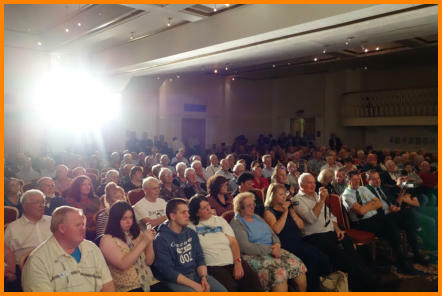 My heart goes out to the members who take the trouble to travel long distances to be in Blackpool. It is easy for me, living in Yorkshire I only have a distance of around 79 miles to travel to the capital of Formby music – so I take my hat off to people like Scott Barker who travelled from Perth, Scotland – a round trip of 490 miles, Gladys Geoghegan who regularly makes a return journey of around 480 miles - but the stars in the travel game this weekend were GFS members Terry & Marie Tucker, Bill & Sue Kornik who with two friends made a round trip journey of 10,550 miles from sunny Californian shores! And this they now do every September! 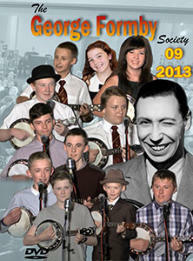 Such is the lure not only of the sound of Formby music, but also to enjoy the unique atmosphere and friendships that are generated at every Formby gathering. September is of course the time in the GFS history when we were officially formed back in 1961, so on Sunday morning we held the 52nd AGM in which new committee members Caroline Stewart and Alan Kershaw joined the 2013 – 2014 committee and we said a fond farewell to retiring member Peter Nixon and assistant treasurer Tony Kenny. We thank them for their years of support. On stage we had once again some fantastic performances from all sorts of talented people both young and old, all giving their best to entertain the capacity audience. It was nice also to welcome another long distance traveller in Angus Lamont who travelled from the Glasgow area and took to the stage for the first time in the company of Stuart Lowther. Kitty Barrett also did her stuff with the Saturday night raffle and almost broke her record for raffle proceeds. 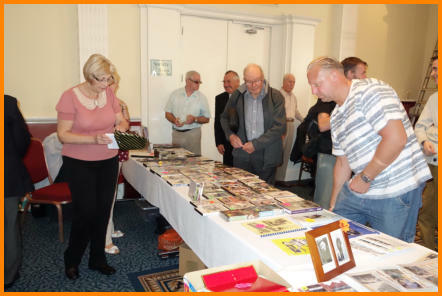 Kitty has been doing the raffle for over thirty years and must have raised a tidy amount of money for the sole benefit of the GFS. One of the surprise prizes was a pair of hotel slippers, won by newly elected committee member Alan Kershaw. Alan was delighted to learn that inside the slippers was a voucher to stay at the new Amado Boutique Hotel in Warrington that was once known as Hillcrest and was once the home of the Formby family. 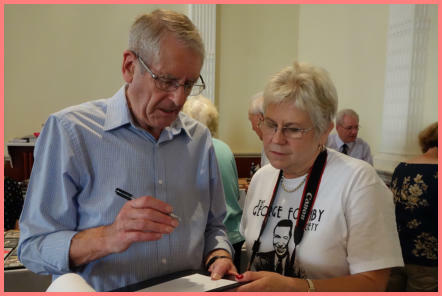 Pat Taylor and Kathryn Pollard were kept busy in the George Formby Society shop and Geoff Shone also helped them at busy times (most of the weekend). I was doing my usual video alongside Alex Barrett - I wonder sometimes just why I bother as these days almost everyone has a recording device in the shape of a smart phone. Having done the official video (when other committee duties have allowed) for the last 21 years, I have always thought it important to capture a record of the convention and because of that we have built up a nice video archive. As you probably know we restricted the use of tripods other than at the rear of the room way back in 1992 to prevent accidents. Can I just remind members of this and also to keep aisles clear of bags, uke cases etc that people could trip over particularly when we have so many people in the room. We need to look out for each other and keep the aisles and exits clear. 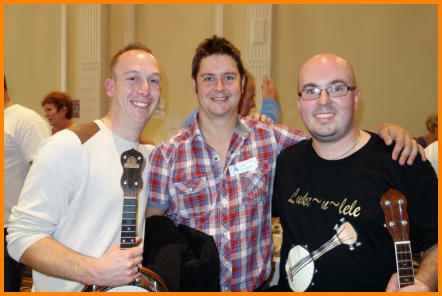 Best moment for me was playing with the new "supergroup", we played in Morecambe and repeated the performance this weekend. Stuart Lowther, Lewis Clifton, Michael Adcock and Bradley Clarke were gracious enough to ask me to join them once again on the Imperial stage - a magic moment for me!